Vampire Emmy and the Garbage Girl Review – AiPT! When someone tells you vampires (or zombies, for that matter) are “so done”, do you believe them? It might just be nobody is doing vampires or zombies in a fresh way. Similar to superheroes in movies, they can continue on forever as long as they’re done well, but duds make you wish they wouldn’t. So is this series continuing a positive trend, or is it one of those stories that prove “vampires are done”? More importantly, is it good? The cover seems to suggest a love story, but writer Pat Shand explains what this series is about in our interview last month in much more detail, so check that out if you’re in the dark. Indie comics tend to break the rules so many publishers enforce on their creative team and this series is certainly doing so. If you think every comic needs an action scene or a formula, you’ve come to the wrong place, but if you want a series that’s going against the grain this might be your cup of tea. 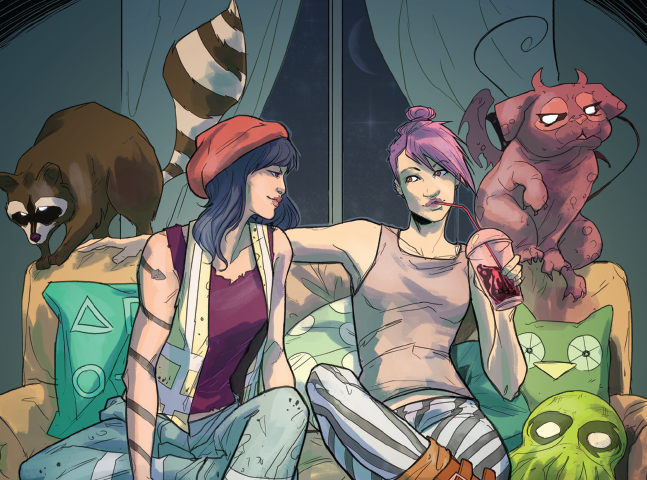 In a lot of ways this one-shot comic is a breath of fresh air as it captures a short period of time between Emmy and her–you guessed it–garbage girl. Their relationship isn’t carried over months or years; there’s no action sequence nor is there a longwinded backstory. It’s all about those brief moments while you’re by yourself falling in love with a stranger. Much like everyone, Emmy has social anxiety and ticks that keep us from just running out and talking to someone. For her it’s the butterflies in her stomach–well, that’s part of it, but it’s also the whole vampire thing. Clearly Pat Shand has created a world where being a werewolf or vampire isn’t that big a deal (though it’s not clear if regular humans are chill with it), but they’re certainly not being hunted. The book opens with this…nice! There’s groundwork here for an ongoing series as we’re introduced to Emmy as a reclusive Netflix-aholic with a monster-dog as a pet. You’ll instantly want to know more about this arrangement–the story progresses just enough to make you want to see Emmy live out a potential romance with the garbage girl. Shand captures the flirting and nerves one gets when approaching someone they like and going on that first date. The characters are easy to understand due to the fantastic character acting of the art. Plus there’s a helpful flashback of sorts as Emmy recounts her relationships and boy are they varied. One of them includes a bit of a joke towards Anne Rice vampire types, which helps convey what sort of vampire-world this is as it’s very self aware. Plus a raccoon is the big villain of the issue and the trash panda brings some laughs along with him too. The art by Roberta Ingranata is a big reason why you’ll feel every emotion from these characters. Expressions are quite easy to read, and even the subtle flirting these women throw off is quite clear. The layouts are varied and tell a well paced story, and backgrounds are detailed and expressive when they need to be too. It’s not easy to make a snake express embarrassment, but Ingranata does so quite well. Maybe it’s because Shand and Ingranata want to sell this as an ongoing to a publisher, but it’s a bit lacking as far as character backstories. What Emmy does for work or really anything beyond watching Netflix isn’t shown or explained. The focus is on the relationship and the anxiety before it even starts, but it makes it hard to decipher who she is beyond her expressions and the relationship flashback. Ultimately if you take away the vampire and monster dog this is an average girl-meets-girl story. That means nerves, anxiety about asking someone out, and the fear of being rejected are the main thursts of the story. It’s done well, but it doesn’t offer a story that’s going to knock your socks off because the characters seem so average. Thankfully the fantastical nature of Emmy and a surprise near the end kick things up a notch. Eternity…hmm no I don’t think I do. This is a one-shot that’s easy on the eyes with an endearing budding love story at its core. If you’ve ever felt anxiety about talking to someone you have feelings for you’ll relate to this comic and probably enjoy it too. The book debuts at Heroes Con on Friday, June 17th, and will be available for preorder online (digital and physical) no later than the 13th.